PP7000 is a Slim / Plastics Panel PC for 15" LCD size. PP6000 is a Slim / Aluminum Panel PC for 10" LCD size. CMPK-374X is a Fanless Industrial Panel PC for 8.4" ~ 19" LCD size. IP65 in the front bezel, High resolution & brightness. 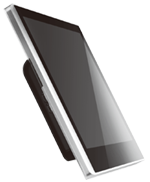 Equipped with Intel® Atom™ processor N270 and Touch screen.